This is my 50th posting, so I have decided to take this opportunity to start a series of “guest appearances” in my blog with my husband’s Prime Rib recipe. A few weeks ago, my youngest brother Manolo surprised us with the news that he was engaged to be married. My parents invited Janitza’s immediate family over for dinner to celebrate the occasion. My mother asked Emilio and I to prepare an informal meal for their guests. Emilio immediately suggested that the main course be his version of prime rib because it can be made with very little effort and would give us a chance to spend some time with the guests instead of being sequestered in the kitchen. All you need is an oven and a thermometer. He feels very confident making this cut of meat since he has been preparing it for many years influenced first by his foodie friend Carlos as well as the guidelines in Dean and Deluca’s Cookbook, which I bought over 15 years ago. This cookbook is amazing and one of our favorites! It is 535 pages of recipes, history and cooking tips (but no pictures or illustrations). Prime Rib gets its name because it is a “primal” cut, that is, one whole natural section of the steer. In this whole section there are 7 ribs in total (Standing rib roast), but any smaller portion of this cut is still called a Prime Rib. Emilio uses a digital thermometer to keep track of the meat’s doneness, but you may also use the quick read traditional ones. Many times he uses a boneless cut. The meat of Prime Rib is very flavorful so all Emilio uses is coarse grain sea salt, pepper and fresh thyme to season it (he uses whole sprigs and then removes the sticks when done, but you can also use dried leaves). He even makes this dish on fishing trips since our boat has a small but potent oven. The smell of this roast is succulent and inviting and fishermen from other boats gravitate towards ours for a taste. 1. 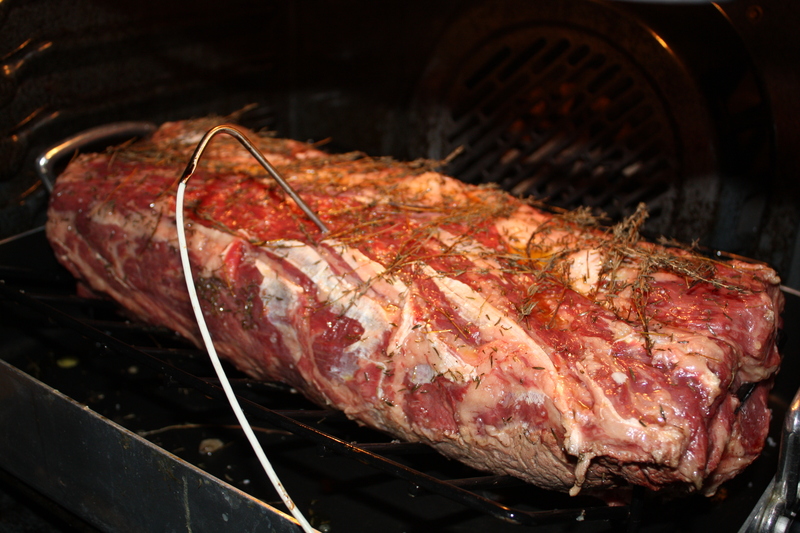 Bring prime ribs to room temperature (about 1 1/2 hours out of the refrigerator). 3. Remove some of the excess fat in the Prime Rib and place in rack of a roasting pan fatty side up (Emilio takes away excess fat and only leaves a fine lining of fat in the top). Place digital thermometer at this time. 4. Season Prime Rib with coarse sea salt (encrust it with your hands on the meat), fresh ground pepper and generously cover with fresh thyme leaves. For a rare meat roast, calculate about 20 minutes per pound. When you are about half an hour of your estimated finishing time, remove roasting pan from oven and insert a quick read thermometer into a fleshy part of the meat near the center (not near bone). Then follow to steps 6, 7 and 8. For an extremely rare meat outcome, stop cooking once it has reached 115ºF. For rare meat, stop cooking at 120º and for medium-rare at 125º. 7. Place roast in cutting board and let rest for about 15 minutes. The roast will continue to cook outside oven going up 5-10 degrees. 8. When ready to serve, if your cut has bones, cut the meat away from bone in one huge chunk. Then cut the filet of meat into approximately 1 inch slices to serve immediately. Cut through the bones and serve them separately. Accompany with rice or your favorite style potatoes. Note: Cut into small pieces to eat and chew!!!! to prevent choking. Savory, simple and wholesome side dish. I make these potatoes a lot because they are so easy and taste so good. It is a quick-fix option to accompany a weekday main dish and should be in every busy moms’ recipe book as an alternative to serve their families something fresh and delicious with little effort. Believe me you will get hooked on these potatoes! I use fresh rosemary from my herb garden, but you may also use dried. 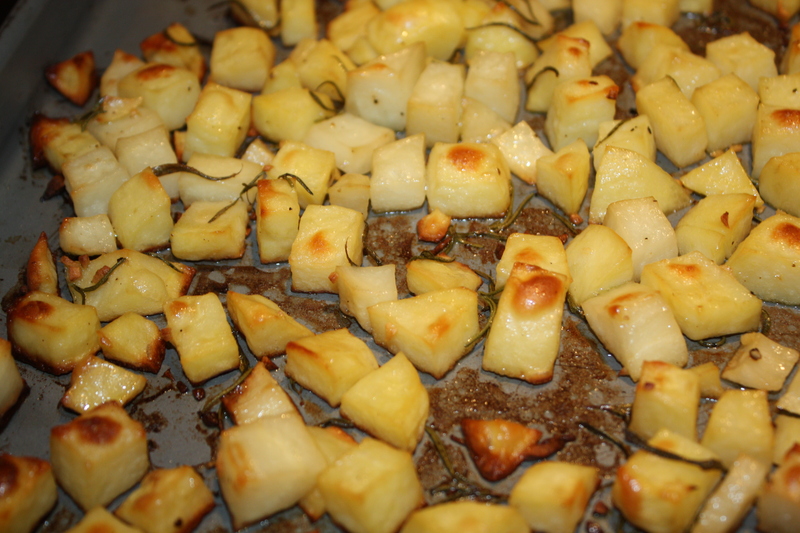 Also, my favorites for this dish are yukon gold potatoes, but you can use russet potatoes as a substitute. 1. 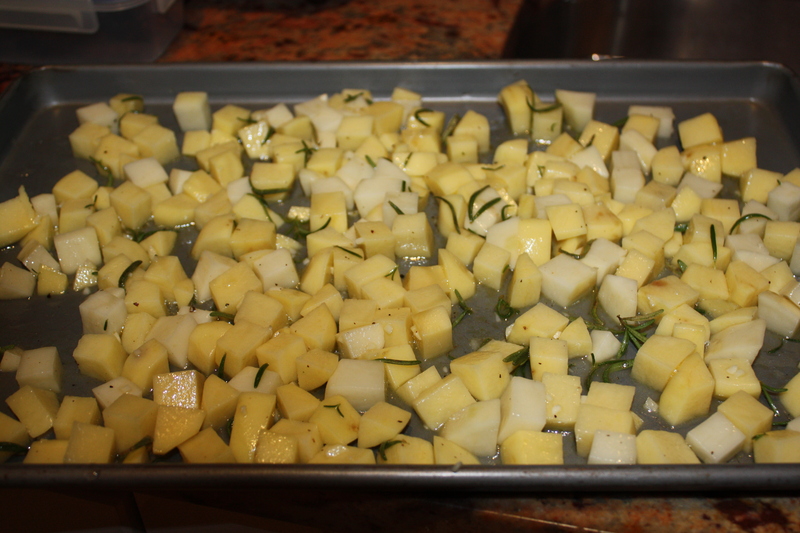 Pre-heat oven at 375º f. Peel potatoes and cut into approximately 1×1 inch cubes. 2. Place potatoes in a large bowl and season with the remaining of ingredients. Mix well with a spoon. 3. Pour potato mix in a jelly roll pan and spread evenly. 4. Roast in oven for approximately 45 minutes. Every oven is different, so if the potatoes have not reached the desired color, put it on broil for a few minutes. Let rest for about 5 minutes, stir and serve.